Thanks to the efficient electric drive the Liebherr LH 26 M Industry is particularly environmentally friendly. These new LH 18 M and LH 26 M machines are particularly suitable for recycling work. Fields of application such as handling, unloading or sorting of waste paper, waste wood and waste materials require high machine availability which is paramount. This is guaranteed by the innovative recycling package. The reversible fan increases productive operation time by reversing the rotating direction of the fan and cleaning cooler and safety guards. The separate position of the climate condenser maximizes the airflow in the cooler and fan unit and guarantees high reliability even when working in extremely dusty environments. In addition to the two-stage air filter, fitted as standard, the prefilter with automatic dust extraction, is responsible for the extra-fine filtration of the engine intake air. 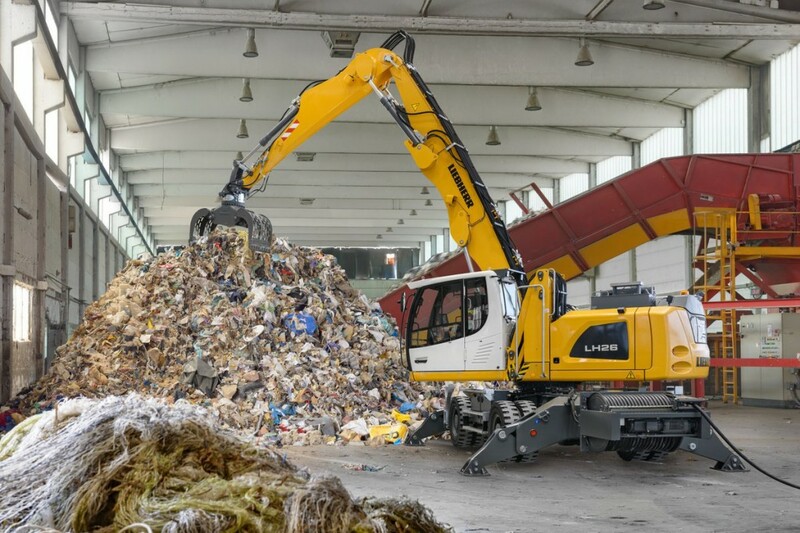 Weighing between 17 and 18 tonnes the Liebherr LH 18 M Industry material handling machine achieves an engine output of 105 kW / 143 HP and complies with the emission standard regulations V. The LH 18 M is also available with road permission to enable it to move between job sites quickly and efficiently. The ergonomically designed cabin provides the highest operator comfort. Control and operating functions are arranged ergonomically and touchscreen displays simplify the operation of this material-handling machine. The LH 18 M impresses with high sensitivity thanks to optimal coordination between engine, control valve and proportional control. By means of the proportional control fitted in series, the steering, cab elevation and supports can be controlled comfortably and securely via the joysticks. This service-oriented machine guarantees short service times and minimizes downtime. All daily service points are easily and safely accessible from the ground. The exhibit at bauma was equipped with a 2.55 mm wide undercarriage, outriggers on the rear and a front support blade. The equipment consists of a 4.85 m adjustable boom and a 2.65 m long stick with bucket kinematics. The LH 18 M is fitted with a fully automatic Liebherr LIKUFIX quick coupling system for fast and safe changeover of tools as well as an SG 20B sorting grapple. The Liebherr LH 26 M Industry electric material handler impresses with detailed and well thought out design. The innovative drive concept includes a 90 kW Liebherr electric motor which guarantees strong and dynamic working movements, low service costs and minimal noise. The drive concept includes a separate electric motor to operate additional tools. This ensures conscious energy distribution as well as maximum energy efficiency. The progressive frequency converter technics of the LH 26 M allow dynamic and sensitive working movements and it can be easily adapted to all common energy supply networks worldwide. The bauma machine featured a 6.6 m straight boom and a 4.5 m stick with bucket kinematics. The equipment also includes an SG 25B Liebherr sorting grapple with a capacity of 0.55 m³ and 800 mm wide perforated tongs. The grapple has a fully automatic central greasing system as standard. Another part of the machine configuration of the LH 26 M at Bauma 2019 was the hydraulically adjustable driver's cabin.